View the threads rcn48 has started. Leave feedback for rcn48 or read feedback left by other members. View the member feedback rcn48 has written of others. 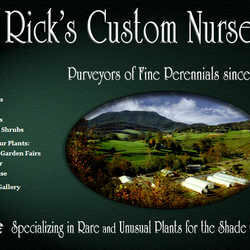 "Purveyors of Fine Perennials since 1981 ~ offering distinctive selections of Hostas, Ferns, Rare and Unusual Perennials for the Shade Garden, Trees & Shrubs. Open by appointment only ~ mail order available through our website. Check our Garden Fair schedule for the dates of our annual Open House as well as a listing of where we exhibit throughout Virginia in the spring and fall.